Looking into switching my pension to more ethical funds. This has been a daunting and opaque process for me, but I’ve been lucky in the support of some very knowledgeable friends. Verdict: Definitely high impact but so far neither easy nor especially fun. The Network Effect: Sharing ideas, starting conversations and hopefully getting more people thinking about the small things they can change. One of the challenges I’ve always had with this stuff is even if I am able to live completely carbon neutral with negligible environmental impact, I’m just one person on a planet of billions. But that’s what stories are for, so I’ve written this post in the hopes that a few of you will get something useful out of my experiences, and maybe between us we’ll have more of an impact. And on that vein, it helps to think about your network: where are you connected, where do you have influence, who do you know who can change things? This month I ran a workshop for my division at King’s to map our ongoing work against the UN Sustainable Development Goals, so we can amplify and celebrate positive contributions and reflect on how to reduce negative impacts. The output will be an ambitious sustainability plan encompassing the work of about 50 people and the workshop is now being prepped to be shared across the university – exciting stuff! Sometimes all it takes is asking the right person the right question at the right time. Our office fruit is delivered by Oddbox, this year graduations went paperless, our last teambuilding afternoon was a Good Gym walk to volunteer at a foodbank. What could your workplace switch, and can you help make it happen? Verdict: Relatively easy, pretty fun, and impact… well, you tell me! Energy provider: Switching to Bulb has only ended up costing us 20p more per month. Sanitary products: Switching to Thinx was a completely revolutionary move. They are elegant, machine washable and so comfortable, I genuinely feel like one of the roller skating, skydiving women in those awful ads! Toilet paper by Who Gives A Crap. I’ve recently switched to these guys and now get toilet paper delivered (so convenient) in plastic free packaging (which is colourful and lovely), made from recycled office paper (no trees harmed in the making). It’s quite a bit more expensive per roll, but the rolls are double the length, so from my initial experiment I think it’s pretty much cost neutral. And they donate half their profits to sanitation projects around the world! Bamboo toothbrushes: I have one of these at the moment, but it’s a growing market with loads to pick from! Buy plastic free from local bulk refill stores. “Landfill Bin” is now written on the top of my kitchen bin, reminding us all to think twice about whether something is recyclable – this has had a bigger impact than I expected it to! This journey starts in October, when I joined On Purpose, I started at King’s and took the WWF carbon footprint test for the first time. Horrified, I learnt that annually I was using 200% of my share of the world’s resources. That same month we were flooded with news of an upcoming climate catastrophe following the IPCC special report and changing jobs had left me with a new work-life balance, with both time and mental space to think about what it might be possible to change. So I set myself a challenge: Every month for the next year I am going to change one lifestyle factor to be more sustainable, and I’m going to try and maintain (or grow) the change for the rest of the year, in what will hopefully be an exponential curve towards a more sustainable lifestyle. Since then, I have made changes to how I get around, how I eat, how I supply my house with basic essentials and even how I dress. I’m healthier, happier and feel more connected to my local area. I’m also more informed about environmental issues and the incredible work being done to tackle them globally. It’s now six months in and when I recently re-took the WWF carbon footprint test I got a score of 125%. I’d never have guessed it could be both fun and easy to make that scale of change. This is what surprised me most: it doesn’t need to be hard, it doesn’t need to be a sacrifice. There are a growing number of social enterprises making sustainable decisions genuinely more convenient and more fun than their less-green alternatives, and I’ve shared some of the ones I’ve liked below. By focusing on things that are easy and fun, I’ve built momentum for the things that are harder, like divesting pensions, and looking for alternatives to short-haul flights. The easy stuff is a great place to start; there are so many things that you change once and they’re done for good. Switching my commute from bus to bike. It’s now March and I’m still cycling every day! Verdict: Easy, high impact and fun! Changing household habits and spending patterns; from energy providers to toiletries. This is one I’ve added to every month, and I’m still collecting recommendations: The full list of things I’ve tried and would recommend is below if you’re interested! Sanitary products switched to Thinx in a completely revolutionary move. They are elegant, machine washable and so comfortable, I genuinely feel like one of the roller skating, skydiving women in those awful ads! Energy provider switched to Bulb, which has only ended up costing us 20p more per month for a fully renewable energy plan and some of my friends who switched are saving money. We now have greener versions of bulky items like laundry detergent, washing up liquid and toilet paper delivered: It’s cheaper, more convenient and the Who Gives A Crap toilet paper especially is more fun! 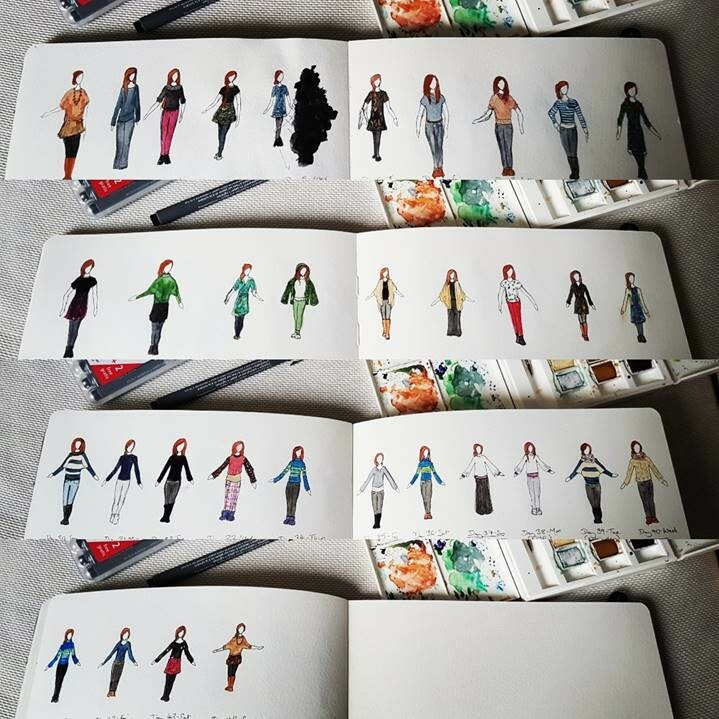 I’ve sketched my outfit each day, to make sure I don’t duplicate, and so have the beginnings of a little outfits menu, which is nice and, who knows, might make me dress better in future! Verdict: Varied, but on the whole easy, high impact and fun! 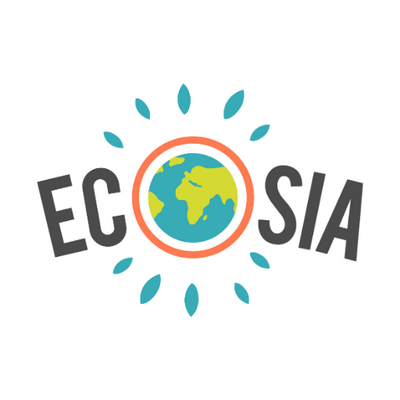 Ecosia is a certified B Corp and was founded in 2009. It’s mission to mission to cultivate a greener world and has the goal to plant one billion new trees by the year 2020. Ecosia does this by donating at least 80% of its advertising income to tree planting programs in Burkina Faso, Madagascar, and Peru. It currently has 7 million active users and has planted over 52, 000, 000 trees so far. Using the app (or desktop search engine) is an easy way to make a difference. 10 million tonnes of food is chucked away in UK every year. That’s equivalent to wasting £17 billion or £700, on average per household. 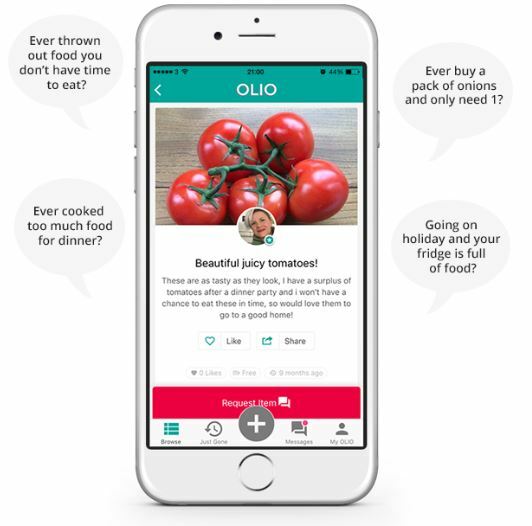 Olio is part of the ‘food sharing revolution’. This app connects people who have food to give away. There are 907,000 people have joined the Olio platform, and so far, has saved 1,218,03 portions of food! To advertise food: download the app, snap a picture, give the item a short description & when and where the item is available for pick-up. This app allows food outlets (Restaurants, Cafés, Bakeries etc.) to advertise any food they have left over at the end of the day– to be sold in Too Good To Go’s ‘magic bags’ for heavily discounted prices. So far, Too Good To Go has partnered with 1,488 stores (such as Yo! Sushi and Paul) across the UK, saving 479, 094 meals from the bin (equivalent to saving approx. 958,188 Kg of CO2). 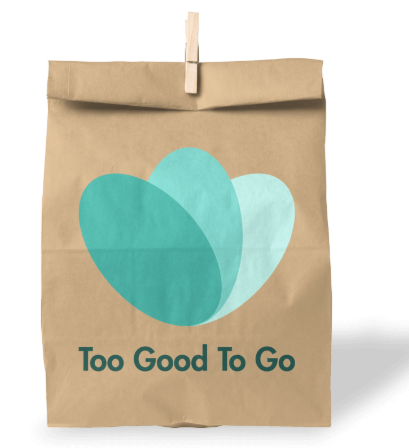 To learn more about Too Good To Go, watch their video here. A million plastic bottles are bought around the world every minute. The Refill app locates sources of free drinking water wherever you are. In London there are over 900 refill stations. Around King’s, there are over 42 refill points around Strand, 38 near Waterloo, 17 around Guys , 10 by St Thomas’ & 4 close to Denmark Hill. Using Refill helps to reduce use of disposable plastic water bottles (nearly half of the bottles in the UK are not recycled, with more than 15 million littered) and save carbon emissions connected to the disposable plastic production. Refill also receives 13p for every refill logged on the app, which goes towards planet protecting campaigns. (The King’s App can also help you locate re-fill station inside of each King’s campus). Keep your refillable bottle with you and you’ll never go thirsty again! Good On You gives you ethical ratings to over 1,000 high street fashion brands. These ratings encompass not just environmental sustainability (e.g. assessing the company’s energy and water intensity, chemical use and disposal), but social sustainability; analysing factors such as child and forced labour, worker safety, freedom of association and payment of the living wage. 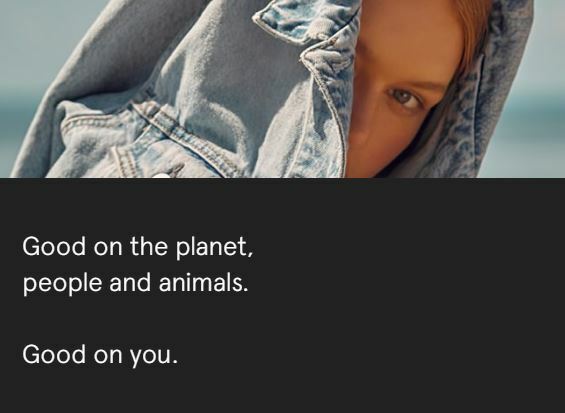 Good On You also builds the rating around if any animals are used (reduced scores linked to the use of angora, down feather, shearling, karakul and exotic animal skin/hair, wool and leather). Users can feedback and make requests of the brands. Read more on how Good On You and how they rate here. This guest blog comes courtesy of Chloe Foster, third year undergraduate student in the War Studies Department and Student Assistant to the Social Science Public Policy (SSPP) Sustainability Champions. Climate change is set to impact our lives in a variety of ways, but one particular global system is set to experience drastic consequences. Our current food system is not secure enough to sustain the challenges of the future because of increased extreme weather conditions, decreased biodiversity and increased emissions. A model developed by Anglia Ruskin University found that if ‘do-nothing’ trends continue, by 2040, the global food supply will be facing food epidemics and mass insecurity. 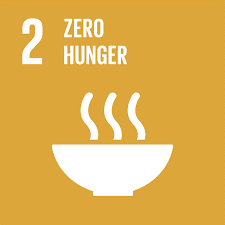 This prediction suggests that SDG 2, Zero Hunger is not as achievable as previously thought. 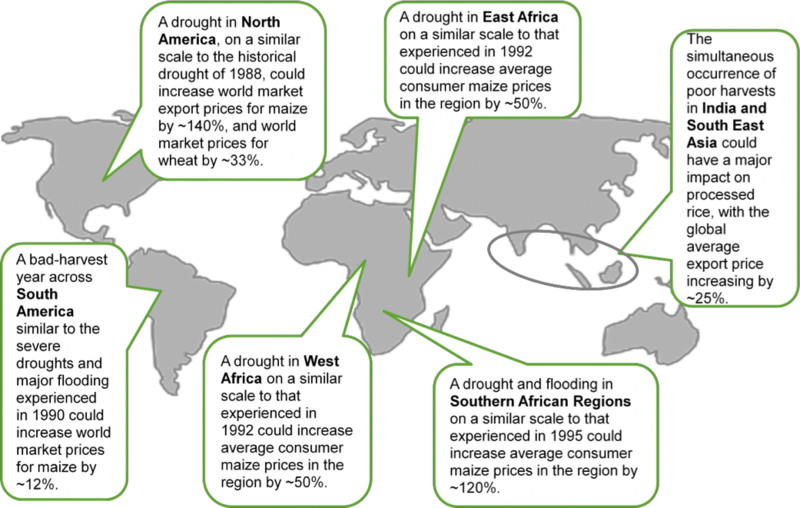 Whilst the aforementioned future challenges are not the whole list, this blog post will explore these main areas impacting global food security. As the Earth’s temperature has risen, the frequency of extreme weather events has increased. Among others, these events include heat waves, drought and flooding. In autumn of last year, Nigeria faced huge flooding which directly impacted on food security and created shortages of rice. The USA has also experienced extreme weather recently; Hurricanes Harvey and Irma caused mass devastation of civilian, commercial and agricultural property. Whilst these natural disasters often pose an immediate threat to human safety, they also threaten crop growth and yields. Climate change is set to reduce harvest yields by 11% on average globally by 2050 and compound the already problematic state of food security. Research conducted by Oxfam found that weather-related shocks have the potential to cause huge spikes in food prices and the average price of staple foods, like cereals, could more than double in the next 20 years. The Food and Agriculture Organisation published a report in February of this year, detailing the increasing loss of biodiversity and its vital role in our food systems. The microorganisms (such as insects, birds and fungi), animals (like hedgehogs) and plants act as fertilisers, pollinators and purifiers of the environment, ensuring the healthy growth of the world around us. However, changes in the environment have led to biodiversity loss and the increased risk of increased food insecurity. Almost 1/3 of fish stocks are over fished, around 26% of breeds of livestock are at risk of extinction and 24% of wild food species numbers are decreasing. However, biodiversity-friendly practices are being increasingly using in agriculture and conservation efforts are increasing across the globe. Whilst these efforts will reduce the speed of biodiversity loss, sustainable frameworks should be used more by governments to formalise these attempts. King’s is promoting biodiversity across its campuses. At Guy’s, there are insect houses and bird boxes, at the Strand campus events are often held on the subject and the installation of green walls and greener spaces are being looked into. The agricultural sector contributes to global warming in many ways. Research by Friends of the Earth, an environmental NGO, concluded that agriculture (including deforestation needed to create farmland) is responsible for roughly a 1/3 of global greenhouse gasses. The production of meat and dairy produce 51% of worldwide global emissions alone and their consumption is set to double between 2001 to 2050. These shocking figures highlight how our diets have a direct relationship to our carbon footprint and our responsibilities as consumers to make more eco-friendly choices. Changing our diets to be more plant-based and seasonal is an easy and effective way to live more sustainably. 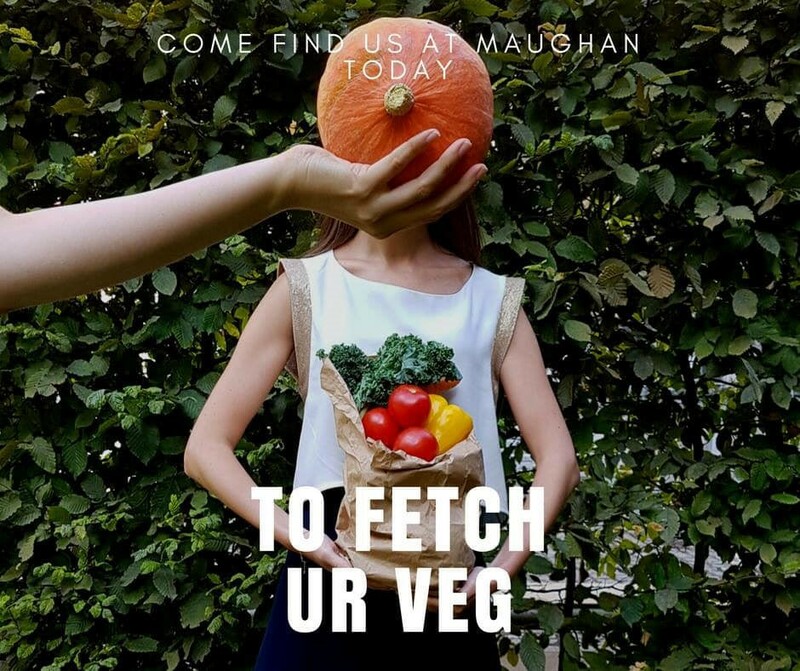 The Fetch-Ur-Veg scheme at King’s is a great way to get involved with this. With the scheme you get a weekly bag of amazing seasonally and locally produced fruit and vegetables, delivered straight to the Maughan library! If you’re stuck for recipes, take inspiration from their Facebook page! Whilst these issues have solutions based in systemic change, there is still power in the individual. As such, I would still promote small changes that can be made to everyday life to reduce your impact on the earth. Eating a more plant-based diet, using more emission-friendly travel and being kind to the world around, individuals can also have a big impact, locally and in the bigger picture. Using http://www.footprintcalculator.org to work out your ecological footprint is a good place to start your sustainability journey! Is this a futuristic dystopian village or an anaerobic food processing plant? This week’s guest blog comes courtesy of Jane Picciano, who is a Sustainability Champion working in the Library Services Team at King’s. This is the story of what happens to all food waste from King’s! I got a chance to join the King’s Sustainability team on a visit to an Anaerobic Digestion plant (Agrivert) in Virginia Water which was coordinated with Simply Waste, the food waste collection company for King’s. The tour was led by Charlie who has worked in the recycling industry for over 15 years, starting in local recycling then moving into food specific recycling. 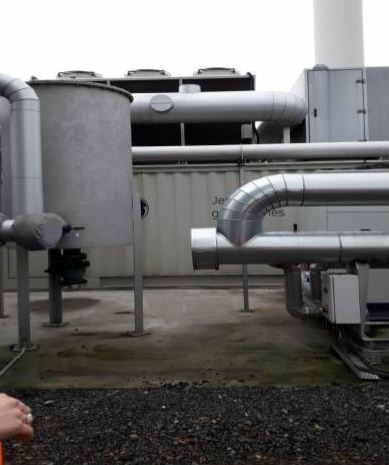 This plant is where all King’s food waste goes to be ‘digested’ then reused as fuel in a methane gas form to power their machines, with any extra sold back to the grid to power 4400 local homes, and as compost to local farmers. Big trucks drive up to the entrance, as they arrive they punch in a designated code which identifies which company they come from. A scale under the driveway weighs the vehicle and then the vehicle is given the green light to go into the recycling bunker. Once inside, the food waste load is dumped into a deep concrete ‘mouth’ where the process of decomposition begins. 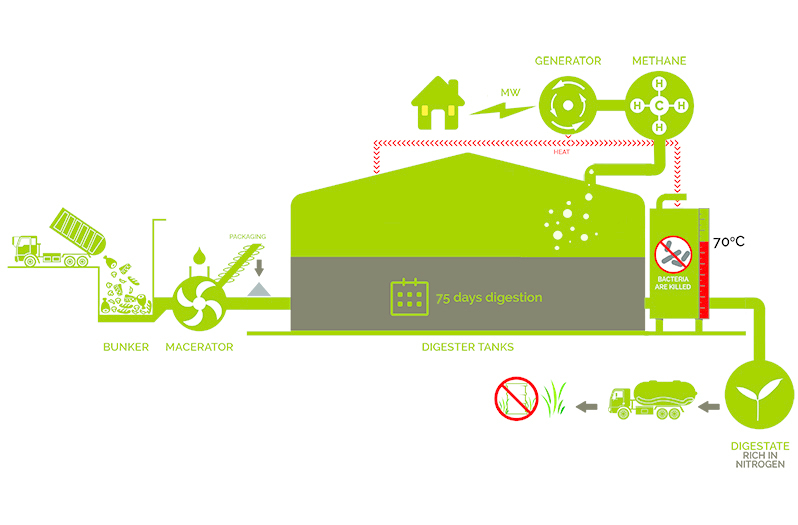 The first stage for the food waste: the ‘mouth’ of the plant before reaching the ‘stomachs’ of the AD tanks. 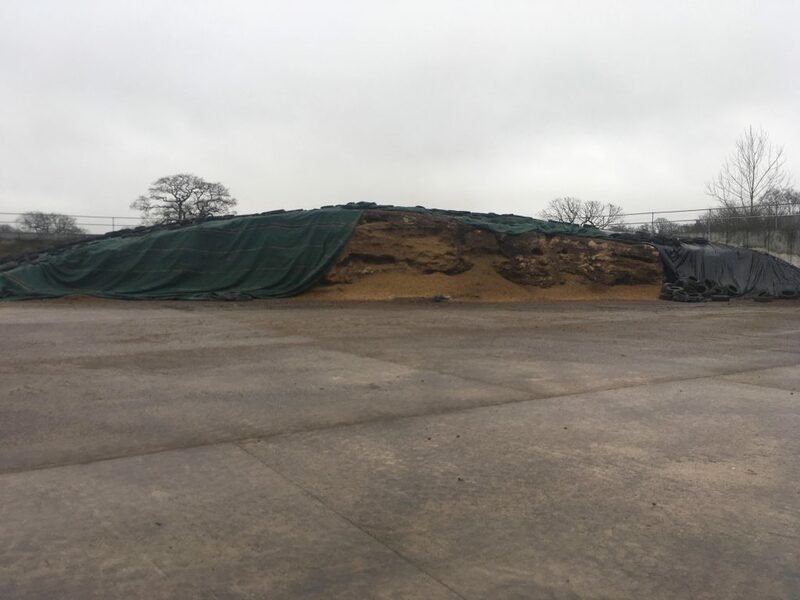 Once the food waste is dumped into this concrete stomach, the waste is mixed with water to make it easier for any plastic contamination to be sieved out. This is where the plastic contaminated waste comes out and next to it a photo of said waste. The plastic waste is sent to an Energy from Waste Plant. 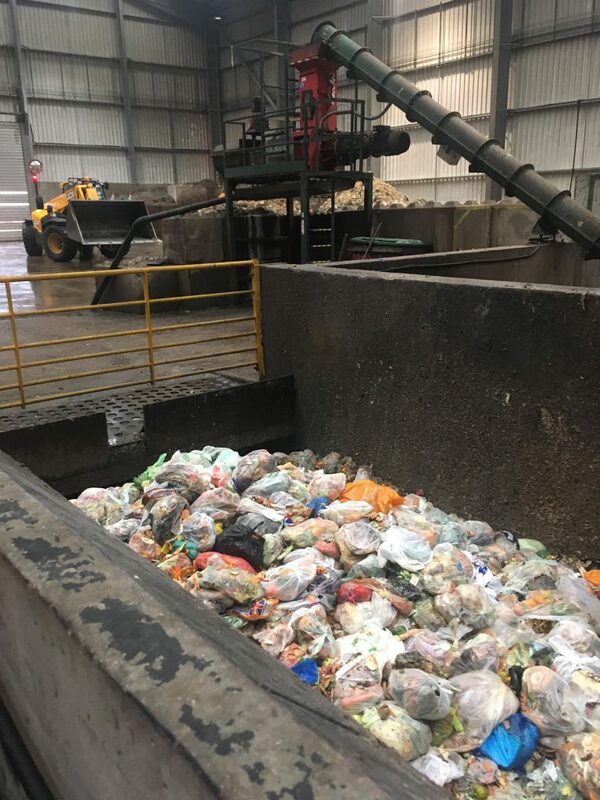 We were told that most food waste recycling companies prefer food to be in plastic bags rather than biodegradable bags as they are very hard to separate from the food. Biodegradable bags stretch and don’t break as easy which makes them dangerous to the machinery that chops everything up finely for digestion. In addition, they contain more water than plastic, so cannot be burned effectively to get energy from waste. If you look closely at the picture of plastic waste, you can see how big the waste is and how easy it is to sift it out. Once that is all done, the food waste sludge goes through one more pipe and any tiny bits of plastic and grit not caught by the grinder is siphoned out. After this, the waste is ready to go and gets fed into one of the holding tanks (or ‘Stomachs’ of the plant). The food waste is now ready for a long ferment (75 days in fact) in one of the five tanks they have. Having the luxury of five tanks gives Agrivert the choice to choose which one to use first and helps them if for some reason there is any kind of mechanical issue or if one of the tanks becomes ‘sick’. Anything can make a tank sick – we were told to think of it like our own digestive system, in that when you have something that doesn’t agree with you, you might need to a bland diet of something like chicken and rice for a few days to get your stomach back to normal. If one of their batches does gets sick, Agrivert has a ‘chicken and rice’ equivalent that they feed the tank and they soon feel better and are healthy again and they can get back to work! 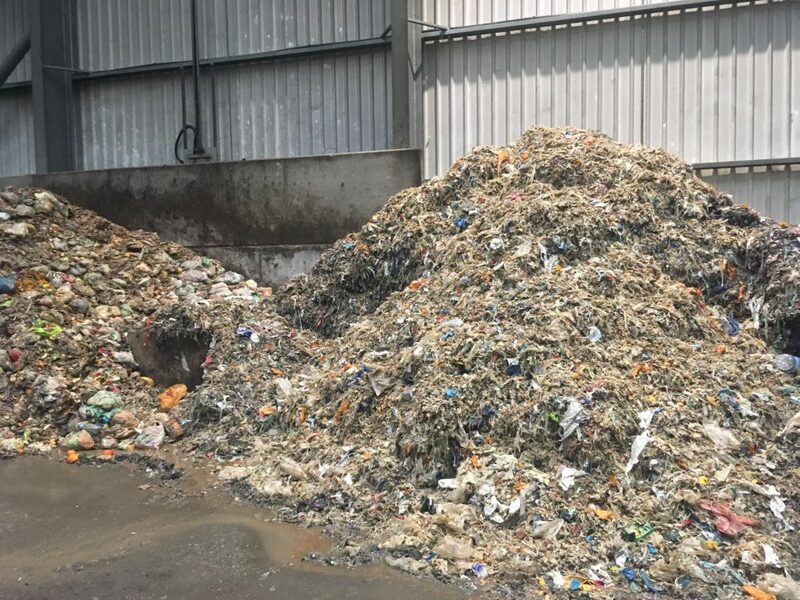 Making sure that the food waste is of a wide variety is important, if the tanks just receive one type of food – such load of bread or curry, the chance of getting sick increases (just like if a human only at one type of food for a long time). Therefore, Agrivert makes sure to balance what the tank receives to reduce the change of it getting sick before the ‘chicken & rice’ is necessary. You will notice that all the tanks have soft domes on them, this is where the gas created by the process collects and is then used to power the Agrivert machinery with any extra sold back to the grid. The power generated from their left-over gasses power up to 4500 local homes per year. The soft domes help identify when there is a problem with the tank, as it will appear sunken and not fully inflated as seen in the images below. You can see the large motors on the outside of the tanks. These are blades that move the food sludge and make sure it is turning continually and kept warm throughout the whole process (at body temperature – around 37 degrees). The blades are different sizes and heights so that everything moves around and utilizes the whole tank. The two long implements you can see above are examples of what the blades that churn the food waste around the tank look like. 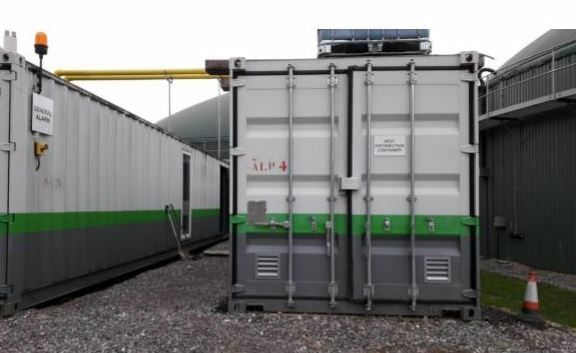 It was interesting to see the re-purposing of shipping containers; these are being used as heat diffusion containers and the had several more as office and staff room space. The entrance has room for a couple of small offices, a large meeting room and presentation space as well as a kitchen and toilet facilities for the staff and guests. The last bit of the tour took us past the huge pipe that you see below; we were told that if this pipe ever stops working it would lead to a very loud and dangerous explosion – it means that the methane expelled from the tanks is not moving freely around and has stopped, building up pressure and finally, exploding. Thankfully that’s has never happened at this Agrivert plant but has happened at others. And this is the story of what happens to the food waste collected at King’s College London! 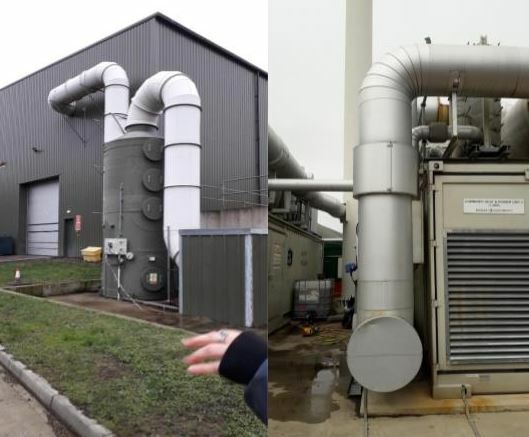 If you get the chance, I would recommend you go and see how one of these plants operates (The Sustainability Team put on one or two trips to King’s waste facilities a year, follow Sustainability Team social media and newsletter to keep up to date on the next). If anything, visiting one of these plants will give you hope for the future of recycling and show you that it is possible to turn waste; food or otherwise into reusable energy that can power homes and fertilize crops. The only thing I would strongly suggest is: bring something to cover your nose & mouth, as the smell is overpowering and it lingers on clothes. Each year, we hold Sustainability Week to raise awareness and educate King’s staff and students about sustainability at King’s. Sustainability Week revolves around ‘#MakeADifference’. The Sustainability Team, alongside student societies and staff Sustainability Champions, put on events with the aim to educate on various areas of sustainability (social, environmental and economic), give back to society and most of all – have fun! 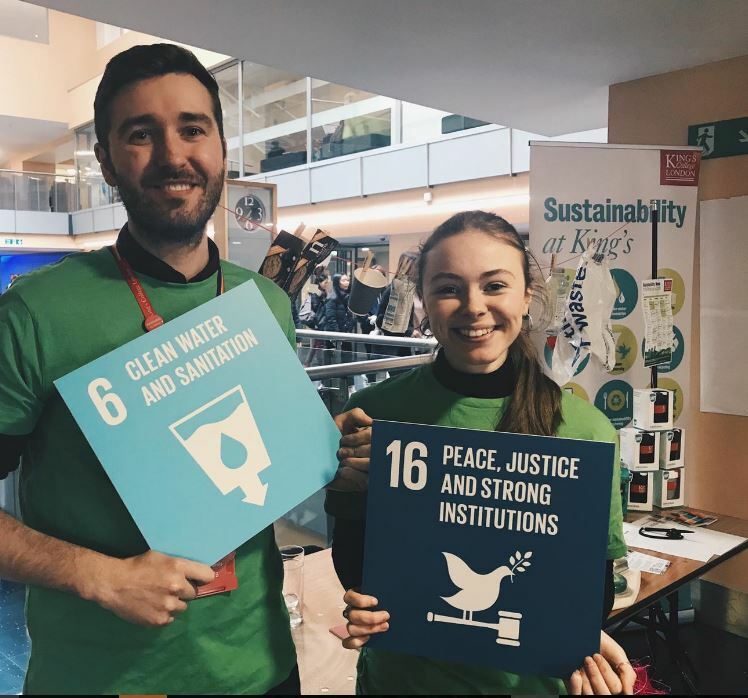 we quizzed you on how many of the 17 Sustainable Development Goals (SGDs you could remember and played the washing line game, where staff & students got the chance to win a Keep Cup and a free tea/coffee if they correctly guessed how long it took seven everyday items to degrade (from tea bags, to tin cans (hint: they rust!) to plastic bags). It was great to talk with staff & students about what interests you most within sustainability and we got the chance to update staff & students on some of the sustainability projects happening at King’s – for example, the Don’t Be Trashy project and behaviour change techniques aimed to reduce waste and increase recycling rates in King’s halls of residences. Josh & Ali from the Sustainability Team at the Sustainability Pop Up, Tues 12th Feb.
King’s VegFest: Studies show that a veganism can reduce the environmental impact that your diet has, and reducing the amount of meat and dairy we consume can positively affect climate change. We hosted this event in collaboration with the King’s Vegetarian and Vegan society. 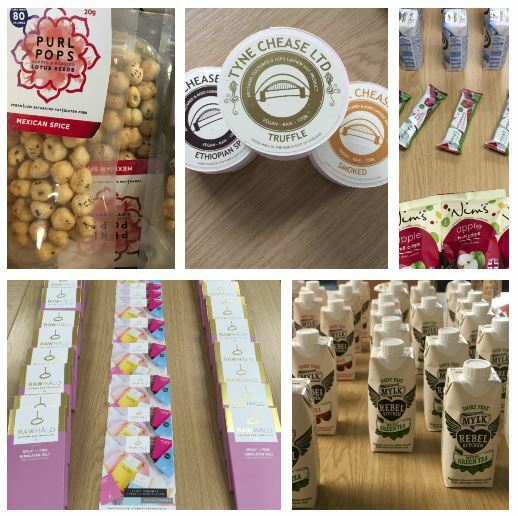 There were lots of free samples from vegan producers, including vegan cheese (thank you Tyne Chease), chocolate (thanks to Raw Halo) snacks (thank you to Purl Pops, Nim’s Fruit Crisps and Freya’s Fruit Bars), Dairy Alternatives (thank you KoKo, Rebel Mylk and to a King’s Alumni own brand: Edenera!). Students and staff also brought delicious dishes for everyone to try, we discussed the environmental impact of the food we eat and general sustainability passions! VegFest Vegan Product Samples, Fri 15th Feb.
Dr Bike: Cycling is not only an environmentally sustainable form of transportation, but one that is socially sustainable due to the value exercise has on physical health and overall well-being. We want to encourage cycling in London and help make it as easy as possible for our staff and students. 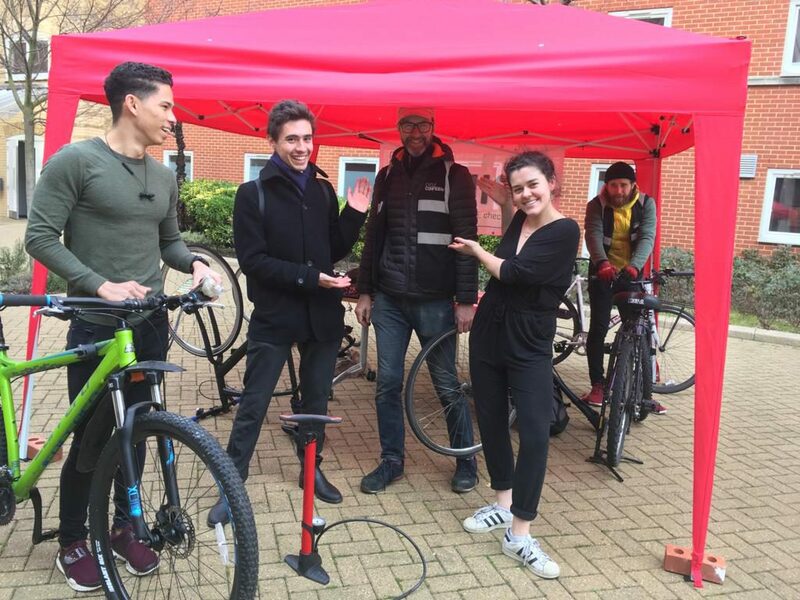 Therefore, we held four Dr Bike sessions across the King’s campuses. These Dr Bike sessions provided free bike checks to students and staff. Mechanics led the session and checked brakes, gears and chains, changed bike pads and gave advice and accurate quotes for whatever they couldn’t fix. There are many Dr Bike sessions happening across London every day, organised through Cycle Confident. To keep up to date with the latest session near you, follow Cycle Confident updates here. Dr Bike at Great Dover Street Apartments (GDSA), Tues 13th Feb.
Film Screening: A Northern Soul: Sustainability often gets bundled into being thought of as purely environmental, with the social and economic sides to it often neglected. This year, for our final event of the week, we chose a film which demonstrated the importance of these two, often forgotten, pillars of sustainability. A Northern Soul is a documentary set in Hull, which follows one man, Steve, a warehouse worker on his journey through Hull in 2017 during its crowing year as the ‘UK City of Culture‘. We see Steve chase his passion of bringing hip-hop to disadvantaged kids across the city, through his Beats Bus. 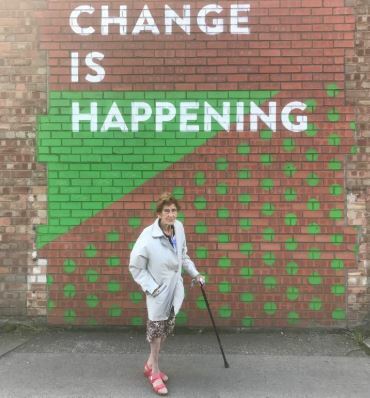 The film raises uncomfortable truths about inequality in the UK, but does so while demonstrating the strength and charm of Hull’s residents in the face of this inequality. The film is available on BFI player. GoodGym Run: King’s GoodGym is a community of runners that combines getting fit with doing good. For this session the runners went to Euston Food Bank. GoodGym volunteers helped to sort out the dry donations of cereal, biscuits and chocolate into sell by date to help ensure no food loss and effective allocation of items according to date. King’s GoodGym is a great way to get fit and to help the local community. To read more on GoodGym click here. 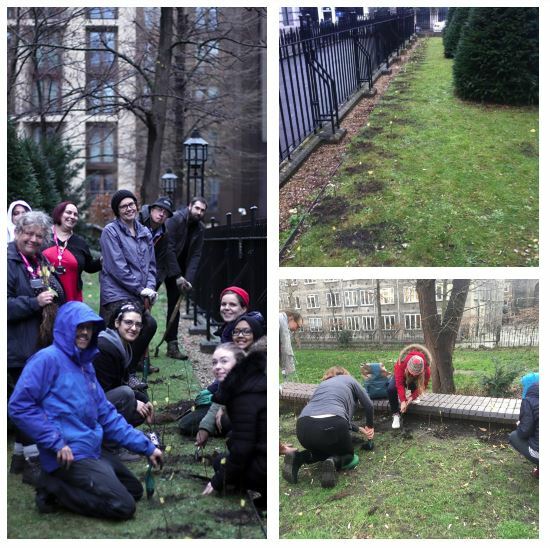 GoodGym runners and walkers, Fri 15th Feb.
re-taped them to ensure their visibility, helped to replant some of the crab apple trees and gave the garden a quick litter pick – all in all, the garden got a good bit of T(ree)LC. Left: Planting the trees in December ’18. Right: checking up on the trees & re-planting some of the growing crab apple trees. Ethical Beauty Talk: Stephanie Green from the Modern Language Centre spoke about how sustainable shea butter can empower women. 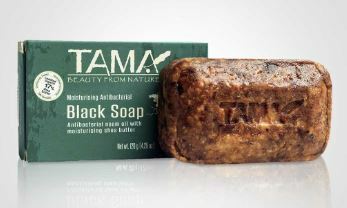 Speaking from her experience living and working in Ghana she told the story behind the TAMA brand, made from natural shea butter. Lots of the beautiful vegan friendly soaps, creams and lotions were also available for sale at the session! Zero- Waste Beauty Workshop: 8 million tonnes of plastic end up in the ocean every year. The UN has stated that our use of plastic is creating a ‘planetary crisis’, and by 2050, the oceans will carry more plastic than fish. Read more here. During the week, we held two zero-waste workshop sessions, co-hosted with the King’s Beauty Society. In these sessions, students learnt more about the global plastic-problem and the individual steps we all can do to make zero-waste living that little bit more achievable. 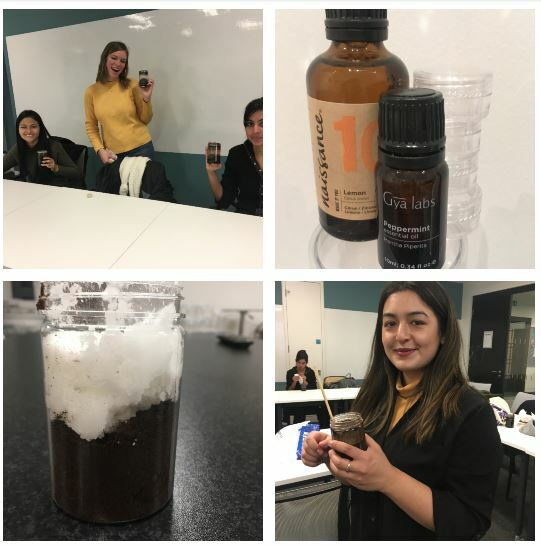 Students got to make their own zero-waste coffee body scrub (using King’s Food own used coffee grounds – which would have otherwise gone to Anaerobic Digestion), lemon lip scrub and peppermint toothpaste! Due to the demand, The Sustainability Team plan to host more events like this throughout the year. In the meantime, a post with the zero-waste beauty recipes will follow on the blog soon. Thank you to everyone who helped organise and took part in Sustainability Week 2019! We love meeting you all and hearing your feedback, ideas and passions. You showed King’s really can #MakeADifference! This January, King’s received the result of it’s first SRA final report, achieving a one-star rating at 59%. 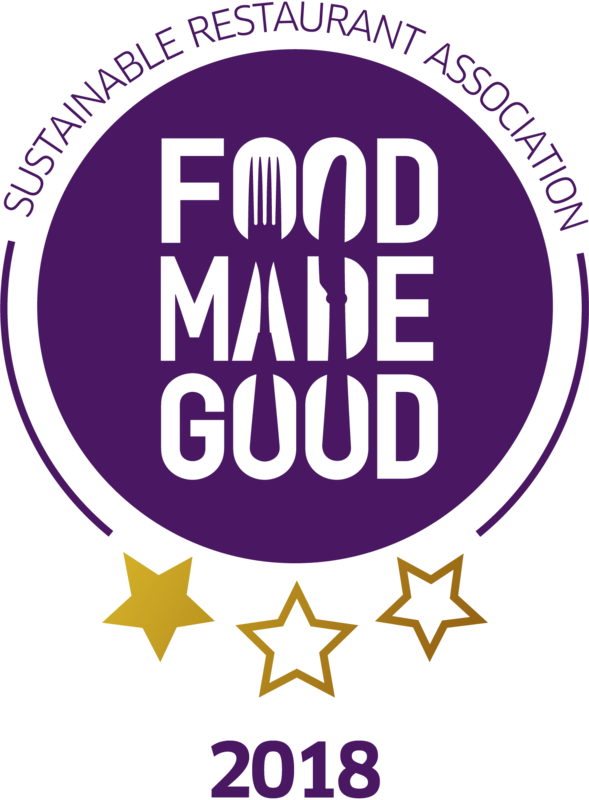 King’s became a member of the SRA in 2016 and submitted it’s final ‘Food Made Good’ report in November 2018 before achieving its first result this January. 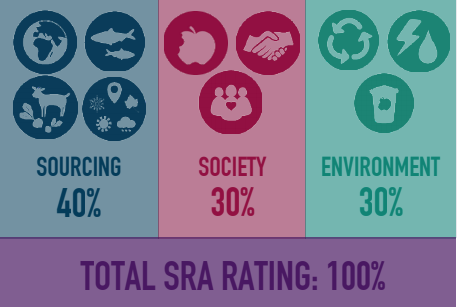 The SRA works with food establishments and universities to guide the route to running a more sustainable operation. 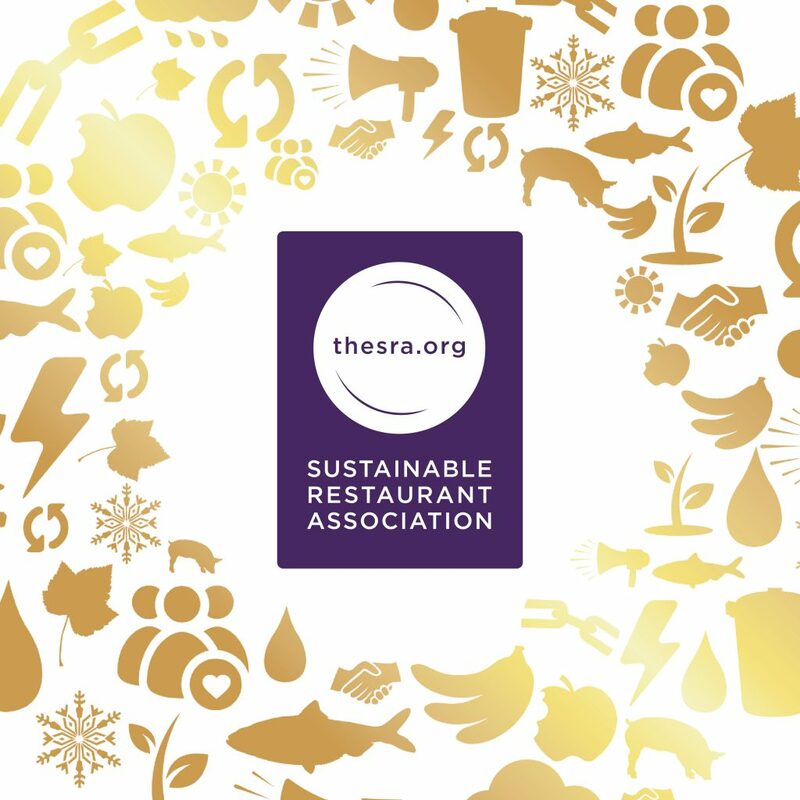 The SRA was set up in 2010 by two restaurateurs, Simon Heppner and Giles Gibbons, who identified that while food service businesses saw sustainability as important, there was no consistency in the way it was defined or addressed. The Esmee Fairbarn Foundation recognised the importance of the SRA and supported it as an initial funder. Since 2010, the SRA has since grown from 50 members, to over 8,000 in 2018. 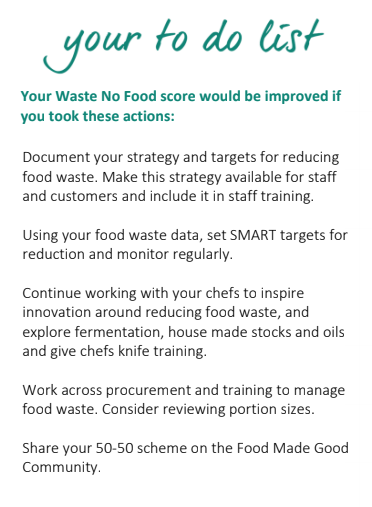 Being a member of the SRA and undertaking the Food Made Good report helps King’s to identify areas for improvement, whilst also benefit from a platform to learn from other establishments and share successes. 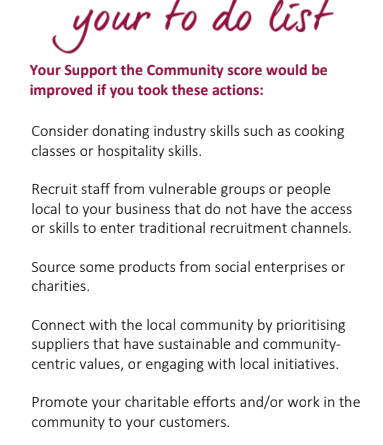 The result of the Food Made Good report comes with a ‘To Do List’ of actions to help us make the impact King’s has, a more positive one. The Food Made Good assessment comprises of three main sections: Sourcing, Environment and Society (as mirrored in King’s Sustainable Food Policy). 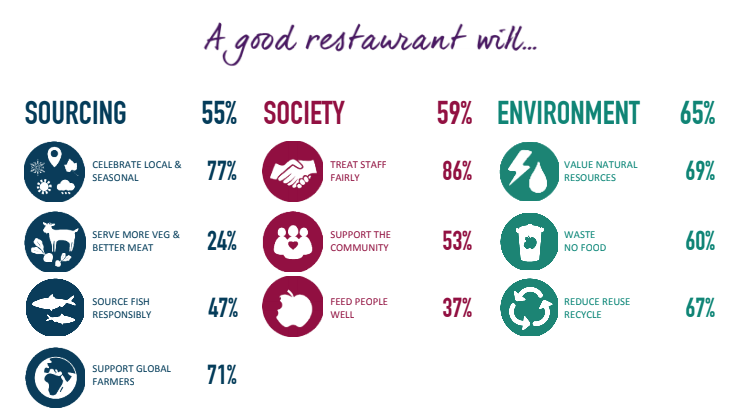 Within these three sections are ten areas the SRA look at to judge how Sustainable the food enterprise or institution is. These areas include: Supporting Global Farmers, Eat More Veg & Better Meat, Feed People Well, Waste No Food and Valuing Natural Resources. 50:50 food saving scheme – all food that needs to be sold that day, gets 50% price reduction, 50 minutes before close. King’s Food are seeking to expand their social influence – for example, King’s Food chefs work with Charities such as the Felix Project. Creation of a fully plant-based, vegan-friendly café. Established a Fairtrade and Sustainable Food Steering Group (2016/17). This meets every 3 months and any interested member of staff or students can attend. (Email sustainabiliity@kcl.ac.uk if you would like to attend the next). To read more on Sustainability at King’s, click here to read the first ever Sustainability Report (2016/17). Sustainability Report 2017/18 to come out mid this year. The value of this report is that it provides tangible ‘To Do’s’ in each of these ten areas to improve the sustainability of King’s involvement in society, environment and sourcing. Below shows the To Do List for ‘Supporting the Community’ (section: Society). This To Do List directly appeals to the Service Strategy at King’s, which brings focus to King’s’ responsibility and ability to get more involved with our local surroundings and communities, use our resources to strengthen ourselves and others and push the social side of sustainability further. Another To Do List for ‘Feed People Well’ (section: society) can be seen below. 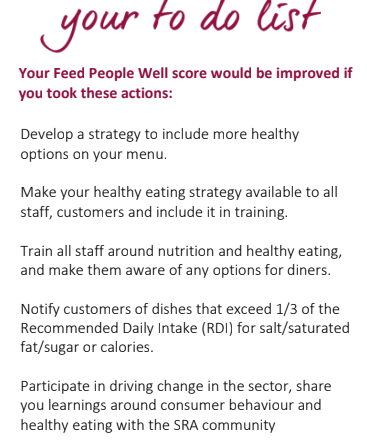 Over the next year, King’s must emphasise effective training of staff and informing the customer to help nudge healthier, more sustainable meal choices. To Do List for ‘Waste no Food’ (section: environment). This To Do List is not just about changing your practice but communicating sustainable practice more effectively and sharing this with other universities/food establishments. King’s Sustainability Team and King’s Food are very proud of this result and look forward to responding to the actions in the To Do Lists. We will be ready to re-submit this year for our 2019 report, to gain our second…and possibly third, star. 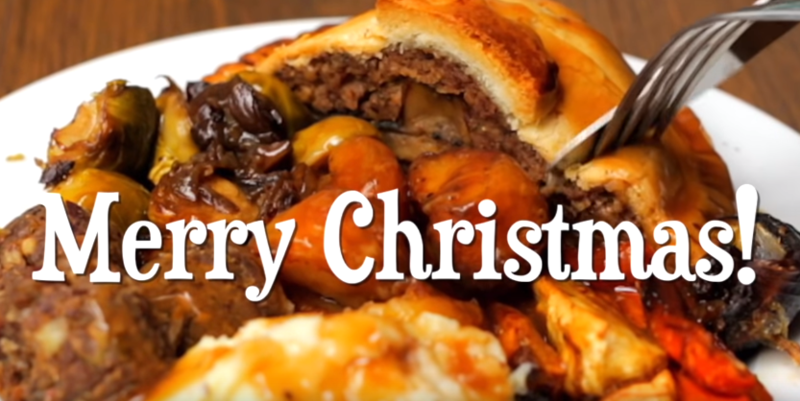 Food is a huge part of the Christmas festivities, so it’s important to get it right. Buy local or buy less. Produce bought locally means you will be supporting small suppliers and the local community, while minimising your carbon footprint. Shop at a local farmers’ market, or try growing some of your own vegetables where possible. BBC Good Food and Love British Food have come up with helpful tables and advice of what is in season across all meat, vegetables, fruit and fish. Buy your fruit and vegetables loose and ditch all the wasteful packaging. Investing in some vegetable bags could help you get around buying packaged fruits and vegetables if you don’t want lots of loose fruit/vegetables in your bag. Try to avoid serving people with paper or plastic plates and cups if you are entertaining guests and use reusable crockery instead. Pack all your goods into a re-usable shopping bag or re-use old plastic bags. If you can, buy drinks in bigger bottles, large bottles will generate less waste than several lots of smaller ones. Don’t forget to put the vegetable peelings from your Christmas dinner in your food waste bin if your council provides one – if not, start a compost bin for your garden or donate your food scraps to local allotments/neighbouring gardens. Read this Hubbub article on facts about freezing your food to mitigate food waste. 51% of global greenhouse gases come from animal agriculture, therefore going plant-based is a powerful action we can take to reduce our contribution to climate change. This recipe video by Bosh! 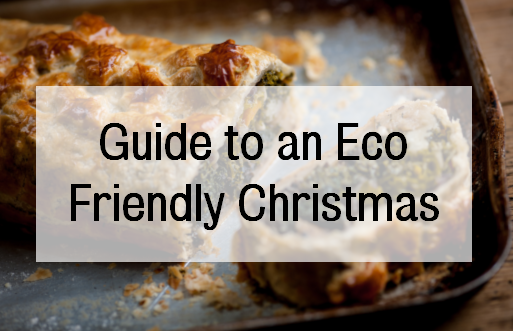 which makes a vegan Christmas dinner including a portobello mushroom wellington, maple roasted veggies, balsamic sprouts, wholegrain mustard mash and the perfect roast potatoes, which show that going meat-free doesn’t mean missing out on a tasty dinner. Avante Garde Vegan has an alternative wellington recipe here. While also providing a bounty of other plant-based recipes, such as Christmas pudding, Yorkshire puddings and a spiced hot chocolate. This week’s guest blog comes third in a series of blogs on the Sustainable Development Goals (SDGs) courtesy of Onna Malou van den Broek, second year doctorate student at King’s in the European & International Studies Department. Onna’s doctorate project titled: ‘The Political Payoff of Corporate Social Responsibility (CSR): CSR as a Determinant for Lobbying Success’, looks at the relationship between corporate sustainability and lobbying, holding a special focus on the SDGs. Are you ready to rescue food? That is the motto of a Dutch restaurant called ‘InStock’. In response to the fact that one third of food production is wasted, they decided to create dishes solely with the unsold products from local supermarkets (1). 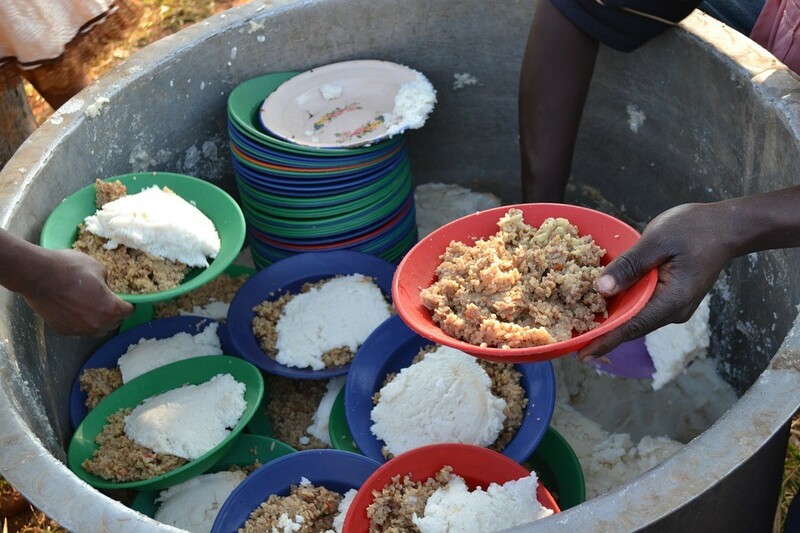 Although we produce enough food to feed everyone, one in nine people (815 million) still go to bed on an empty stomach. After a period of decline, world hunger is on the rise again because of conflict, droughts and disasters. The targets underpinning SDG 2 address the access to and production of food, while supporting rural development and protecting the environment. By 2030, all people must have access to safe and nutritious food, and all forms of malnutrition must be ended. Malnutrition can, amongst other things, lead to growth cessation for young children and unborn babies. Furthermore, the agricultural productivity and income of small-scale food producers must be doubled in a sustainable way. Importantly, food production must be able to maintain ecosystems and the diversity of seeds, plants and animals, whilst being resilient to climate changes. Additionally, investments in agricultural should be strengthened, trade restrictions corrected, and extreme food price volatility limited. The Situation: From Hunger to Health? If current trends continue, the targets set in SDG 2 will be largely missed by 2030 (2). Malnutrition sits awkwardly with the large amount of food waste and increased levels of overnutrition and obesity. There are large in-country and intra-country differences, most notably between developed and developing countries. In the later, almost 13 percent of the people are undernourished, with peaks in Asia (33 percent) and Sub-Saharan Africa (23 percent). Alarmingly, poor nutrition is still the case of nearly half of deaths in children under five. To increase food security, governments must top up their spending on small farms, crop diversity and women’s access to agricultural resources. A Conference at the University of Wageningen (4) posed the question: How can we create partnerships that can rid the world of hunger and malnutrition? Insights included that there is a need for a good institutional environment allowing farmers to practice sustainable agriculture. What is more, malnutrition is not only an issue in developing countries. Even though healthy food might be available, it can be affordable to certain communities or there is a lack of knowledge on how to differentiate between unhealthy and healthy options. Interestingly, Lawrence Haddad, director of the Global Alliance for Improved Nutrition, emphasized on making hunger uncomfortable for governments: “hunger and malnutrition are the result of choices about how we use our scarce resources. You can choose to use those resources differently”. Know your food. Find information, for example on: (a) the ingredients in your products i.e. are these grown with respect for earth and oceans? Are the products seasonal? (b) the supply chain i.e. how many intermediates are there? How fair are workers’ wages? and (c) animal-welfare of diary, meat and fish products i.e. do producers ensure good living conditions? Buy responsible. With the relevant knowledge, use your purchasing power to ensure sustainable production. Try to buy products from local producers through farmers markets, buy less meat and fish, eat seasonal fruit and vegetables and inform about the products at your favourite restaurant or lunch cafe. Nourish yourself, friends and family. Good nutrition starts with yourself! Ensure your meals are nutritious and share this habit with your environment. And whilst you’re at it, plan your meals so there is no need to waste. Do you want to know more about this concept? Please visit their website here. If you want to read more about progress towards SDG 2, you can visit the UN website here or the UNSTAT website here. To get an overview of the humanitarian and food crisis in Yemen, I used the fact sheet of USAID, which you can read here. Luckily for you, the whole conference is captured by video and available here. You can read more on the chef’s manifesto here.